For many parents, baby monitors are essential: they enable you to know when baby’s crying and in some cases, whether it’s a “come now!” cry or just a snuffle in their sleep. Baby monitors are not created equal, though. Some do the basics for a knock-down price, while others can support enough cameras to monitor entire dynasties or double up as home security systems. We’ve found the best baby monitor to be the BT Video Baby Monitor 6000. Coming from the kings of communication, this baby monitor will allow you to enjoy some time out, while ensuring your baby is safe and sound. Not only does it let you keep an ear out and an eye on the little one, it offers two way communication so you can talk to your baby, too. You may also want to consider whether you want your baby monitor to play lullabies, display things like room temperature, produce different light levels or pan, zoom and tilt to you can keep a complete eye on your baby’s sleep space from afar. This device from BT pretty much provides you everything you could possibly want from a baby monitor. First of all, the two part baby monitor features a fully operational and controllable camera which collects footage and displays it on an LCD screen so you can keep watch from the other room. Secondly, if you can see that your baby is becoming restless, you can either play them a lullaby or soothe them with your own voice, thanks to the 2 way speaker system. With temperature display and night vision also massive features, this baby monitor is certainly worth the spend. The best baby monitor out there right now is the Luvion Prestige Touch 2. You might not have heard of Luvion, but you’ve almost certainly heard of the Mother & Baby Awards - the Touch 2 picked up the Gold award in 2017 for its ease of use and range of features. It supports up to four cameras with split and quarter screen viewing, has LED lights to alert you when you’ve got the sound switched off, has a nightlight option and preset lullabies to help soothe your child and offers both infrared night vision and room temperature monitoring. The main draw here, though, is the enormous screen: it’s seven inches diagonally, with touch-sensitive buttons below the display and a joystick to control the camera. It’s very easy to use and the supplied camera includes a ceiling mount and fixings. Very similar to our first pick, this Motorola offers the same level of camera control so you can keep a complete eye on your baby’s sleeping space. The camera is easily movable, so whether they’re napping in their cot or asleep in their playpen, you can keep watch via the LCD screen. Thanks to the two way communication, you can soothe your baby if you can hear they’re getting restless, while the temperature display helps you to keep the room at a comfortable sleeping temperature. BT’s baby monitors are generally sturdy and reliable if a little bland, but the Lightshow range offers something a bit different: the star and moon lightshow projects shapes onto the ceiling to give baby something to gurgle at. The show can be accompanied by one of 18 different lullabies, and there’s an adjustable nightlight to make sure you don’t fall over anything when you’re popping in to settle your baby. There’s no video but you do get two-way audio and really good range of up to 300m outdoors and realistically around 50m indoors. That and the rechargeable batteries means the BT monitor is a good option for parents who like to enjoy good weather without missing baby’s cries. When your lounge is that far away from where you baby is snoozing, you’ll need a long range baby monitor. With the ability to send signals across 300m, you’ll be able to hear the slightest sound from your baby’s nursery wherever you happen to be in the house. 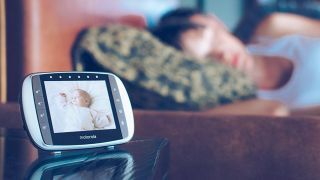 Your baby will also be able to hear you too, thanks to the two way audio system, while a gentle night light built into the monitor provides a reassuring glow if they happen to become restless. Let’s start with the price first: the Angelcare AC1100 is widely available for much less than RRP - at the time of writing it’s £169.99 on Amazon. While similarly priced rivals may offer better camera features and multi-room support, the AC1100 has something most monitors lack: a pressure sensor for baby’s crib. It needs a flat base, but it works very well through even thick cot mattresses and you can adjust the sensitivity so it doesn’t trigger too often. The idea is that if baby stops moving or rolls off the sensor area you’re alerted immediately. The rest of the AC1100 isn’t bad, but there are a few issues: the screen isn’t the best and users report pretty poor battery life from the supplied AA and AAA batteries. Although not strictly a baby monitor, the Nest Cam IQ offers many desirable features. The camera shoots in hi-resolution, so you’ll be able to see your baby and their room in full HD detail from your phone screen. The Nest Cam is also capable of 2 way communication, so you’ll be able to soothe your baby with your voice if they start to grumble. You can set the device to send you alerts to your phone if it picks up any sound, while its Wi-Fi connection means you’ll be able to receive footage and alerts, no matter how far away you are from the baby’s room. Motorola makes very good baby monitors, as you might expect from one of the world’s biggest radio companies. The MBP41S is well worth considering now that it’s being widely discounted: it’s currently £79.99 at Argos. For your money you get video and night vision with pan, tilt and zoom from the wall mountable camera, 2-way audio and temperature display, and the range is good for 300 metres outdoors and around 50 metres indoors. The parent unit comes with an adaptor so you’re not munching through AAAs unnecessarily, and there’s a power saving mode for when you’re not running on mains power. If you want a baby monitor with video but don’t want to pay lots for it, this is definitely one to watch. Whether they’re grumbling, stretching or wide awake bouncing, you’ll be able to catch everything with Angelcare. The monitor is kept under the mattress and sends you alerts if your baby hasn’t moved for 20 seconds. You’ll be able to check visuals of your baby via the LCD screen, while the monitor will alert you to any noise that the baby makes. Although this baby monitor doesn’t feature 2 way communication, it’s well worth the spend if monitoring your baby’s movement is a priority. We’re big fans of Philips’ AVENT baby monitors, which we’ve consistently found to be reliable and with superb sound quality and noise cancelling. But this is different: instead of DECT audio it’s an HD 720p camera, and you can connect up to 10 cameras for viewing on up to 3 devices simultaneously. There’s temperature and humidity monitoring, two-way audio and camera panning, tilting and zooming, but the big achilles heel is that without Wi-Fi it doesn’t work. If your router isn’t reliable, you’ll need to upgrade that before splashing out on this - although the good news is that once again the RRP isn’t reflecting real world prices. Expect to pay closer to £140, or even less for open-box deals. If you’re taking full advantage of nap time by getting the house in order, you may miss something if you nip away from the monitor for a couple of seconds or choose to get on with some hoovering. To ensure you’re alerted wherever you happen to be, you can wear this wristband. Choose to hear baby in the nursery, set it to vibrate whenever it picks up a sound or switch it to light up. With a fairly long lasting battery and a decent range, this is a great value gadget that’ll make keeping an eye on your baby super convenient.